”ADVANCED SURVEYING INSTRUMENT (INDIA) PVT. LTD.” provides integrated products and solutions for customers in the field of Land Surveying and its associated service support. With Sanding as its major Partner the company has established a state of the art Calibration facility in Delhi with collimator system. The company has a nationwide presence with a strong network of dealers. We believe in expanding ourselves with reflection of Quality, Competitive and Customized services rather than big advertisements and banners. We believe that our customers big or small are well proficient in judging and distinguishing the sense of equinity and giving due value to our never ending service support zeal. GPS/GNSS Systems, DGPS, Total Station, Electronic Total Station, Digital Theodolite, Construction laser, Surveying equipment, Laser leveler, Laser marker, DISTO, Micro optic Theodolite, Digital level, Magnetic locator, Prism, leveling staffs, Tripod, Surveying instrument, Laser distance meter, Electronic Theodolite, Auto level, level. "WE BUILD RELATIONSHIP AND TRUST"
"ADVANCED SURVEYING INSTRUMENT (INDIA) PVT. LTD." provides integrated products and solutions for customers in the field of Land Surveying and its associated service support. With Sanding as its major Partner the company has established a state of the art Calibration facility in Delhi with collimator system. The company has a nationwide presence with a strong network of dealers. "Our mission is to make ADVANCED SURVEYING INSTRUMENT (INDIA) PVT. 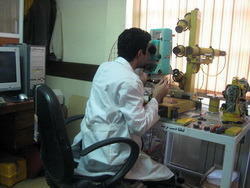 LTD Service Center first service & Technical Support Centre for all make of survey instruments." "We have service / Support as our Primary business objective and secondary sales to the satisfied customers." We commit to deliver consistent service aimed at meeting and exceeding customer expectations within statutory norms of regulatory authorities by continual improvement in processes and growth and development of all team members. Looking for All Surveying Repair and Calibration Services ?